In the interest of full disclosure, I should point out that when I saw Prometheus Saturday I was abnormally, freakishly tired – a deep, deep fatigue that’s held on for a couple days now. I’m falling asleep in the middle of walking down hallways. Most likely it’s because my body is adjusting, coming down from all the meds I was taking after my recent surgery. I didn’t fall asleep during the movie, but my attention wandered a couple times so it’s entirely possible I may have missed some important points. I may go back to see it again just to make sure I got it all. 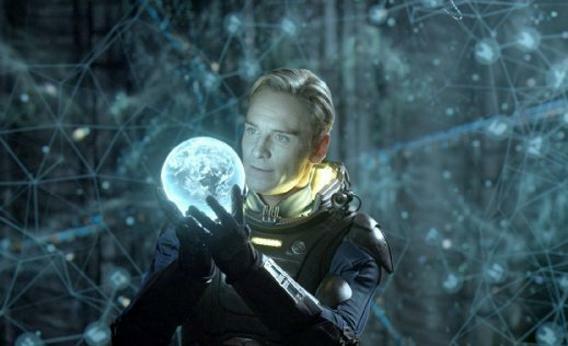 Just so we’re clear on the high expectations I went into Prometheus with. On most points, I was satisfied. On others… well… damn. It’s a good movie. But it’s not great. And it really should have been great. Make no mistake, it’s visually arresting. One thing Ridley Scott knows and can probably do in his sleep, is arresting visuals. Almost all of his films are feasts for the eyes, with every sequence a visual work of art. And Prometheus has all that – including a few sequences that will stick in your mind for a long, long time… The self-surgery scene, for one. David the android gazing in wonder at the aliens’ three-dimensional stellar navigation system, for another. But the story… well, the story is almost great. I had the feeling that there were three or four competing scripts while they were developing it, and when they finally settled on one, someone forgot to delete the superfluous scenes. Brilliant, compelling ideas were raised and then forgotten, only to be brought back later when it didn’t make sense, then to be suddenly discarded again as we moved on to the next idea. There are a few aggravating plot holes, and way too many instances of characters doing stupid, stupid things that no one would ever do. Oh yeah, we’re being set up for the sequel. The last scene is practically the opening prologue for the next one. And it looks like Ridley Scott has no intention of being screwed out of them, like he was for the Alien franchise. And yes, this movie is set in the Alien universe, before the events of the first film, but it’s not a prequel, per se. This is NOT the same planet, and that’s NOT the same alien spaceship the Nostromo will discover in a few decades. So get those misconceptions out of your mind right away. All that said, it’s a good movie. It’s worth the ticket price. It’s worth seeing in 3D. Oh, one more thing. The opening theme is one of the most gorgeous pieces of music I’ve heard in years. It’s soaring, sad, majestic and hopeful all at the same time. In fact, it’s almost out of place in the bleakness of the film’s vision and storyline. But gods, such wonderful music! It’s music that can, completely out of context, bring tears to your eyes. Some have complained that it’s repeated too many times during the movie, but to me, it was welcome each and every time. Definitely worth buying the soundtrack for.